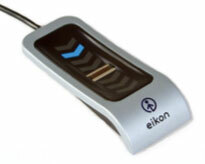 The Eikon family of USB fingerprint readers provide quick and reliable biometric authentication by leveraging proven technology, from swipe sensors found in millions of laptops to government certified touch sensors. Software Development Kits (SDKs) offer flexible APIs to enable fast integration with a broad range of applications. Government certifiedThe only silicon fingerprint sensor that is FIPS 201 certified. Patented technologyThe patented technology reaches up into the ridge and valleys of the fingerprint to capture fine print details and to detect live skin. The result is that our capacitive technology is able to capture a wide range of fingerprints and reject spoofing attacks. SecureThe Digital ID Hardware Engine companion processor performs match-on-device and OTP generation in secure, dedicated hardware. Anti-spoofing technology counters attempts to fool the fingerprint reader. Works well with dry, moist, or rough fingerprintsReliable performance over the widest population of users. Reads even the most difficult fingerprints.